Activity and Study Guide to accompany the recording I Got A Bullfrog. About the Recording I Got A Bullfrog: Folksongs For The Fun Of It. I have been collecting songs from the southern mountains for over twenty years. In that time I have performed for hundreds of thousands of children around the country. 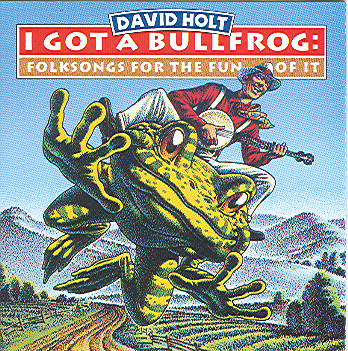 I Got A Bullfrog: Folksongs For The Fun Of It brings together the favorite folksongs that children love to sing and hear. The southern mountains are a treasure trove of traditional music and song. This music is a unique blending of Anglo and African-American traditions. The early settlers to the region came from England, Scotland and Ireland in the late 1700′s and early 1800′s. They brought their ballads and fiddle tunes with them which formed the basis of traditional mountain music. Many of the old songs and tunes from “across the waters” still exist in the region today. The mountains created a natural isolation for the people there and the music changed very slowly compared to the rest the country. But changes did occur. The musical influences that affected other parts of the nation during the 1800′s also affected the mountain folk. You can still see the early influences of blues, jazz, minstrel and sentimental songs in modern mountain music. The early settlers came to the mountains with European ballads and dance music, but almost immediately began creating new pieces like “Cindy,” “Blackeyed Susie” and “Mole in the Ground” that told of life in their new home. The Civil War introduced the African banjo to mountain people. They also began to hear minstrel songs which were some of the first blending of black and white musical ideas. Medicine shows began to tour through the mountains. They would often have an African-American entertainer with the show who would sing songs like “C-H-I-C-K-E-N,” “The Cat Came Back” and “Who Broke The Lock.” It was in the medicine shows that many mountaineers first heard the guitar and harmonica played in a blues style. Roy Acuff, Uncle Dave Macon and many other early country performers got part of their musical training in the medicine shows. In the early 1920s, recordings and radio spread southern old-time music throughout the United States. Fairly obscure folk songs became widely known and played because of their exposure through this new media. Songs like “Keep on the Sunnyside,” “When the Train Comes Along” and “Sail Away Ladies” became known in the mountains in this way and are still played today. The beginnings of commercial country music started with folksongs like these. Gradually, newly written songs and “stars” began to be the driving force in popular country music so that by World War II, the old-time folksongs had been displaced in the media. 1. Doodle Daddle Day – This is an old tune for which I created new words and chords. There are several unusual instruments played on this song. The “twanging” sound is the jaw harp (sometimes called jews harp or juice harp). The odd guitar sound is the bantar. This is a combination of banjo and guitar. Sometimes called a gitjo, it has six strings like a guitar, but the body of a banjo. The first solo you hear is Russ playing a guitar, the end solo is Russ playing the bantar. You can also hear me playing a pair of wooden spoons. 2. The Cat Came Back – This song was a favorite of early country musicians. It was recorded many different times, from Fiddlin’ John Carson to Sonny James. Most folk tunes have more than one version because they were passed from one person to another without being written down or recorded. Different people in various parts of the region would make up their own version of the song. Activities: A. There are many versions of “The Cat Came Back.” Find two others and compare melodies and words. B. This song tells a story with lots of action. Illustrate the story of “The Cat Came Back.” C. Watch how a cat moves when it stretches, licks its paws, plays, etc. Make up a cat-like dance to go with the chorus. D. Do cats really have nine lives? Where did this myth come from? 3. Blackeyed Susie – This is often played as a fiddle tune for dancing. Compare the fiddle sounds in “Blackeyed Susie” and “Doodle Daddle Day.” Notice how the fiddle plays single notes in a jazzy style on “Doodle Daddle Day.” In “Blackeyed Susie” the sound is full and driving, playing two strings at the same time. Activities: A. This song makes you want to dance. Try this simple dance: All join hands in a circle. During the verses dance to the center and back to place (4 beats forward, 4 beats back). During the chorus circle left and back to the right. In the instrumental breaks have someone call simple figures: do-si-do, right elbow swing all the way around and back with a left elbow, swing your partner with a two hand swing, etc. B. This can be a call and response song. In concert I sing “Hey, Hey” and the audience answers “Blackeyed Susie.” Try it that way. 4. Ain’t No Bugs On Me – Fiddlin’ John Carson and Moonshine Kate made a recording of this in the l920′s. I am playing a ukulele here. That is Larry Paxton on tuba. Activity: A. Make a list of all the bugs in your region and make a little chant that will fit in during the instrumental breaks. For example: ladybug, cockroach, horsefly, flea, doodlebug, butterfly, stinkbug, bee. 5. C-H-I-C-K-E-N – Sam and Kirk McGee recorded this in 1927. Roy Acuff told me he used to sing it in a medicine show. Grandpa Jones is Ragtime Joe in this version. Activities: A. This is a good example of the difference between a speaking voice and a singing voice. Try saying the letters and singing the response. C. Try tapping out the rhythm of the washboard: One and two and three and four and with accents on the second and fourth beats. 6. Mole In The Ground – When I first came to the Mountain Dance and Folk Festival in Asheville, NC in 1969, there on stage was a 90 year old man in a white suit playing and singing this song. It was Bascomb Lamar Lunsford, local hero and founder of this oldest folk festival in the country. You can hear the banjo very clearly on this cut. This is a good example of old-time clawhammer banjo style. If you look at the cover art, you will notice how I am holding my right hand to play in this style. (It is hard to do sitting on the back of a frog.) Basically, you strike the strings with the fingernail of your index finger in a downward stroke. The thumb picks the 5th or drone string. This is the oldest style of banjo playing and came to this country from Africa. Get a recording of a bluegrass banjo and compare it to the clawhammer sound. Common bluegrass banjo tunes include “Foggy Mountain Breakdown” and “Dueling Banjos.” The library is a good place to find these recordings. Activity: Write down all the animals you could wish to be and make a list of the advantages of being each of them. Using this list, try making new rhyming verses to “Mole in the Ground” using the following form: Oh, I wish I was a………………… If I was a ……….I would………..
7. Who Broke The Lock – Blind guitarist and singer Riley Puckett (of Gid Tanner and the Skillet Lickers) recorded this old minstrel song in the 1920s. I have rounded up verses from other versions and put them all together here. Activities: A. What other nonsense songs do you know? C. Try clapping on the off beat. Notice how the bass is playing on the 1 and 3 beats. The little clicking sound is made by the bass player tapping the strings against the fretboard. This click sound is on the 2 and 4 beats or the off beat. Try clapping along with the click. Notice that emphasizing the off beat gives the song a lift and bounce. 8. I Got A Bullfrog – This song started out as a bedtime story for my children, about a giant pet frog you could ride. In the story he went on to become the first amphibious president of the United States. The song was inspired by an old fiddle tune melody. The odd sounding instrument you hear during the fiddle solos is a mouth bow. I learned to play this ancient one-stringed instrument from Morris Norton of Sodom, NC. Activities: A. Using the cover art as a starting point, create a story about the adventures of a man and his 500 pound bullfrog. You can copy the front of the study guide and color it as well. Send your ideas to me so I can incorporate them in a story for telling. C. Name the bullfrog and send me your ideas. D. Write more verses about other oversized animals. E. Have you ever laughed this hard? Tell the story of what was so funny. 9. The Glendy Burke – Stephen Foster wrote many of our most famous songs in the mid 1800s. “Oh, Susanna,” “Camptown Races,” and “Swannee River” are just of few of his many songs. Even though he was a professional songwriter, many of his works have been absorbed by folk tradition. B. Listen to and sing other Stephen Foster songs. C. What can you learn about the time period from the words of the songs? What can you learn about steamboats? 10. Cindy – This was one of my favorite folksongs in elementary school in Garland, TX. When we moved to California, I was surprised to find children singing it there as well. I was pleased to find it was well loved and played in the mountains of North Carolina when I moved there, too. B. Listen to the mandolin. Notice how it takes the place of the drum in other types of music. It keeps a very solid “chop” on the 2 and 4 beats. Try clapping along with the mandolin. Stay right with it. This is where the musicians are putting the emphasis. If this is difficult, slap your legs first and then clap your hands. This will put you on the 2 and 4 beats. C. Can you hear where I start clog dancing? Try your own fancy footwork. 11. Long John – I learned this in Gatesville, TX where I spent my childhood summers. There was a prison there (I wasn’t in it) and this song about a man running away from prison was well known by the kids in town. Activities: A. “Long John” is a classic call and response song from African-American tradition. Try echoing the singing and clapping along. Slap your legs on the first beat, then clap your hands on the 2 and 4 beats. B. Notice the rhythmic mouth sounds I make. Can you make up some different ones? C. Have a student learn the lead and echo his or her singing and sounds. 12. Keep On The Sunnyside – This song was made popular by the Carter Family during the 1920s and 30s. It was their theme song on station XERA in Del Rio, TX. The station was actually across the border in Mexico and therefore had no legal limits and tremendous power, some say 500,000 watts. (In Del Rio you could pick up the telephone and hear XERA.) The station transmitted early country music around the U.S. and into Canada. Activities: A. All the instruments on this recording are acoustic instruments. This means they are not electrified or amplified. Compare the natural sound of the guitar in “Keep On The Sunnyside” with an electric guitar sound. D. Discuss what this song is about. How can we keep on the sunnyside? 13. Sail Away Ladies – Uncle Dave Macon was the first star of the Grand Ole Opry in 1925. His recordings still inspire us today. He was full of life and had a vast repertoire of old songs and banjo tunes. Some of the words in this version have been added by school children I have worked with over the years. Activity: A. Write new verses to “Sail Away Ladies” using this form: If I had a ……….. I’d give it to……..
14. Yes, Papa – I have spent a number of days with the oldest woman in the world, Susie Brunson. She was born Dec. 25, 1870. The first instrument she remembers seeing around her Bamberg, SC home is the washboard. Ms. Brunson recalls all night dances to the rhythm of the solo washboard. She inspired me to write this song. Activities: A. This is a good call and response song for practicing vocal dynamics. See if you can answer dynamically. B. Listen to “Yes, Papa.” Make a list of all the things that have to be done around your house. Now, make them rhyme and create your own call and response song. Think of a place you want to go when all the chores are done and put that in the second half of the song. Send me your versions. 15. When the Train Comes Along- This is another song from Uncle Dave Macon of Murfreesboro, TN. Uncle Dave was the first star of the Grand Ole Opry in 1925. As a young man growing up in Nashville, TN, his parents ran a hotel for traveling performers and Uncle Dave learned many songs from the guests. For most of his life Uncle Dave ran a freight company, hauling cargo on horse-drawn wagons. In his work he met many folks who played music from whom he gathered a large repertoire of songs. When trucks started hauling most of the cargo, Uncle Dave went into the music business. He was a raucous, natural entertainer and audiences loved him. Those of us who play old-time music still regard him as one of the greats. I learned this song from one of Uncle Dave’s old 78 rpm recordings. 16. This Little Light of Mine – A Black gospel standard and my favorite song. Activities: A. Notice how this song builds by adding instruments. Can you name the instruments as they are added? B. Can you think of someone who has a special light? C. What other words can you use for this light? Examples: friendly, giving, caring, loving, interested, committed etc. D. What are your own personal “lights”? 2. All the songs presented here were made for singing along. That is the number one activity…learn to sing them. Have fun! 3. I collect children’s art. Make a drawing of any song and send it along. We’ll enjoy it. 4. Get another old-time music recording, a Bluegrass recording and a modern country record. Compare what you hear. 5. Ask your parents what folksongs they learned as children. See if they are familiar with any of the songs on I Got A Bullfrog. Find out where they heard them and if their versions are different. 6. Talk to the oldest adults in your family and neighborhood. Make a list of all the skills…not just the work-related skills, but the little fun things as well. Can they do yo-yo tricks? Can they make simple toys or instruments? Do they know a dance, song or old-timey game? Pick one skill from each person and get them to teach it to you. David Holt is a four-time Grammy Award winning musician, storyteller, artist, historian, and radio and television host. For more than forty years, he has collected and performed the songs and stories of the Blue Ridge Mountains. He learned this treasure trove of music directly from musical greats including Doc Watson, Roy Acuff, Tommy Jarrell, Etta Baker, and Grandpa Jones. In addition to making numerous critically acclaimed recordings, Holt is host of popular television programs including the PBS series David Holt’s State of Music, Folkways, and Great Scenic Railway Journeys. He was featured in the film O Brother, Where Art Thou and was host of the Nashville Network’s Fire On the Mountain and American Music Shop. From 1998-2012, David performed with Doc Watson. “A highlight of my career,” says Holt. He currently tours the country performing solo, with Josh Goforth, and with his band, David Holt and the Lightning Bolts. In 2016 David was inducted into the North Carolina Musicians Hall of Fame. Says Holt, “When I was 10 years old my father taught me to play the spoons and the bones. The rhythm bones had been handed down in my family for five generations by my Texas forefathers. When my family moved to California, I started playing drums and continued to play in rock and roll and jazz bands until I went to college. In college I met banjo player, Steve Keith. The two of us traveled to the southern mountains in 1969 and found a world of living traditional music. I began learning the old-time clawhammer style banjo. In 1973 I moved to Western North Carolina to learn about mountain music first hand from the old-time mountaineers. Sam Bush (fiddle and mandolin) is well known for his work with the New Grass Revival. . Sam is regarded as one of the finest musicians in Nashville. His wonderful musicianship and sense of humor shine through on this recording. Russ Barenburg (guitar, bantar) is one of the best acoustic guitar players in the country. Listen to his subtle choice of notes and beautiful tone. Roy Huskey, Jr. (bass) is in great demand in the studio as an acoustic bass player. Listen to his big tone and rock solid rhythm. Grandpa Jones (Ragtime Joe on C-H-I-C-K-E-N) is well known for his regular appearances on HEE HAW and the Grand Ole Opry. He has helped keep old-time music before the public for over 50 years. Dennis Burnside (piano) is a master of many styles of piano. Listen for his blues and gospel influences. Kathy Chiavola and Alan O’Bryant (harmony vocals) Kathy has appeared on two other David Holt recordings as well as on recordings by Vince Gill, Garth Brooks and many others. Alan sings and plays banjo with the Nashville Bluegrass Band. Listen for his high lonesome harmonies. Steven Heller (producer) The producer’s job is to bring out the best in all artists and to oversee the project from beginning to end. There is no one better at this than Steven, and he makes it fun! 1. When did you start playing music? David: I started drumming on the furniture when I was in elementary school. At 14 I actually started taking drum lessons. I began learning the banjo when I was 22. Music has always been important to me, but I have college degrees in biology, art and elementary education. 2. Why did you start playing folk music? David: I fell in love with the sound of the old-time banjo. I just wanted to learn to play for my own enjoyment. It slowly grew into a career. 3. How many instruments do you play? David: I play banjo, guitar, slide guitar, ukulele, bantar, hammered dulcimer, lap dulcimer, autoharp, bones, spoons, harmonica, jaw harp, mouth bow, washboard and paper bag. 4. Why do you play so many? David: I really like the sounds they make. Each one creates a different mood. When I came to the mountains I was surprised to see the variety of instruments that people played. I want to show that diversity in my programs. I try to play even the very basic ones like the spoons or washboard as musically as possible and not as a gimmick. 5. Who did you learn from? 6. What is your favorite instrument? David: The old-time banjo is still my favorite and best instrument. 7. Do you have a family? David: Yes, I live with my wife Ginny outside of Asheville, NC. My son Zeb lives in New York City. Our wonderful daughter Sara Jane died in an automobile accident when she was 10. We miss her every day. 8. Where have you traveled playing music? David: I have played in almost every state. For the U.S. State Department I have traveled to Africa, South East Asia, Canada, Europe and Latin America. 9. Do you always wear a hat? David: I love hats. I’ve been collecting fedoras from the 1930′s and 40′s for a long time. When I started playing on television the hat became a trademark. Now, I always wear a hat when I perform. I also collect neckties from the same period. 1. Where are the southern mountains? The Appalachian mountain range extends from Georgia to Maine. The southern region of the Appalachians includes parts of Georgia, North Carolina, Tennessee, Virginia and West Virginia. 2. Where is Asheville, NC? In the Blue Ridge Mountains of Western North Carolina. 3. What do you call the folk music you find there? There are several names: old-time music, traditional mountain music, early country music. In the past it was called hillbilly music. 4. How is it different from modern country music? The songs are generally folksongs handed down from one generation to the next, and not written by professional songwriters. There is more emphasis on preserving an older tradition than on creating something new. The instruments are not electrified. Most of the people playing old-time music are non-professionals playing for their own enjoyment. 5. How is old-time music different from bluegrass music? Bluegrass grew out of old-time music in the 1940′s. Lester Flatt called Bluegrass music “old-time music in overdrive.” The banjo style is one essential difference. Bluegrass banjo is played with a highly syncopated 3-finger roll. Old-time clawhammer banjo has more of a “loping, bouncy” feeling to it. Bluegrass musicians perform many newly written songs and old-time musicians generally rely on traditional songs. Basically, they are brothers in the same family each with his own personality. 6. Can you hear the African-American influences in many of the songs on I Got A Bullfrog? For example, listen to the bluesy, jazz licks from the fiddle and bantar on “Doodle Daddle Day.” Notice the harmonica and the rhythm of the piano and guitar on “The Cat Came Back.” Many of the tunes including “Blackeyed Susie” have a banjo, an instrument originally from Africa. “C-H-I-C-K-E-N” is very likely from the Black tradition. “Long John” is an African-American folksong using the call and response form. The “Glendy Burke” was written by Stephen Foster who started writing minstrel songs. “This Little Light of Mine” is an African-American folksong. These are just a few of the many examples. 7. You’ve talked about traditional music as living music. Why do you want to carry it on; why is this important to you? I feel like I owe it to the old timers I learned from. I was very lucky to see the end of an era. Many of the folks that were my mentors were born in the late 1800s. Their repertoire was set before the days of radio, records or mass media. That gave their music a wonderful quirky soulfulness the world will never see again. I am talking about people like Dellie Norton and Brazilla Wallin from Sodom, NC, Tommy Jarrell and Fred Cockerham, Byard Ray, Etta Baker, Bessie Jones, 123 year old Susie Brunson, and so many others. I hope I can bring a little part of that spirit to each concert I perform. I also had the chance to get to be friends with some of the really great professional old time musicians…like Roy Acuff, Grandpa Jones, Wade Mainer, The Morris Brothers, Walt Davis, Big Joe Williams, Johnny Shines, and now Doc Watson. I can’t begin to tell you how much I learned about playing music, making a living and putting on a show from these folks. The old songs and tunes are filled with the spirits of the folks we learned them from…and the folks they learned from. You see, I honestly feel that the great traditional songs and tunes are bits of wisdom put to music. If they could simply be spoken…they would have been. But music adds a soulfulness that cannot be put into words. That is why we have music. So the best songs and tunes are passing down an unspoken wisdom about being alive in this world. Now, that wisdom can just be a sense of joy as in a tune like “Soldiers Joy”, or it can be much more mysterious like the tune “Ducks on the Pond.” You play these tunes over and over and they affect your entire being. 8. What can you do to make sure our folksongs are around for another 100 years? Hold the first spoon between your thumb and your first finger. It should go across the middle bone of your index finger. The index finger wraps around the back of the spoon and holds it tightly against your palm. The thumb should press down on top giving you a firm grip. Turn the second spoon upside down and place it between your index and middle fingers. The bottoms of the spoon bowls should be back to back. Your middle finger wraps around and holds the edge of the second spoon tightly against your palm. Basically you’re making a fist around the spoons. There should be a space of about a half an inch between the bottoms of the spoons so that when you hit down on your leg they will click together. Put your opposite hand, palm down about seven inches above your leg. Start playing by hitting your spoons down on your leg and up on your palm. Go back and forth, hitting down on your leg and up on your hand, getting a click going each direction. Put a slight accent on the 2 and 4 beats by hitting a little harder on those beats. To make a roll, spread the fingers of the opposite hand wide apart and make them rigid. Let the spoons bounce down across each rigid finger in a rapid motion letting the last beat hit on your leg. Use the roll as an occasional flourish, always going back to the basic rhythm. Remember, if you are having trouble keeping the spoons in line, you are probably not holding them firmly. Keep your index and middle fingers pressed against the edge of the spoons and pressed tightly against your palm. HAVE FUN!! Copying: Please feel free to copy this Study Guide. Special thanks to Sheila Donahue and Judy Thomas for their suggestions for the activities.